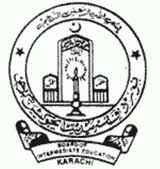 Board of Intermediate Education Karachi (BIEK) is the Intermediate Education Governmental body in Karachi, Province of Sindh, Pakistan. It was established as a separate entity in 1974 through the "Sindh Boards of Intermediate and Secondary Education" amendment act No. 20 of 1973. The Board has the power to organize, regulate, develop and control Intermediate Education. The Board of Secondary Education Karachi has similar authorities for matriculation. The controlling authority of the Intermediate Board is the Chief Minister of Sindh or his nominee.